After the success at Canal du Nord, the Canadians faced their main objective, the city of Cambrai. Cambrai was a key railway centre for the German army, and the site of a bloody battle the year before that saw the first major use of tanks. Now tanks were once again rolling towards the town. 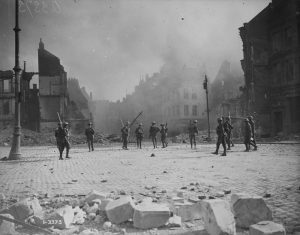 By September 30, the 3rd and 4th Divisions had reached the outskirts of Cambrai, though efforts to capture the city stalled as the Corps circled it and Currie tried to work out a plan to take the city. Urban warfare was not something in which the Canadians, or most of the Allied armies, had experience, and fighting the German Army house-to-house was going to be not only extremely difficult, but also likely to result in very high casualties. Canadians entering Cambrai. Advance East of Arras. October 9, 1918. Canada. Dept. of National Defence/Library and Archives Canada/PA- 003270. Cambrai itself was very lightly defended as German troops were pulled out to reinforce other areas, but the Canadians still had to contend with land mines and booby traps left behind. The city was liberated by the Allies on October 9, 1918. The Canadian Corps incurred over 10,000 Canadian casualties in the advance on and liberation of Cambrai. 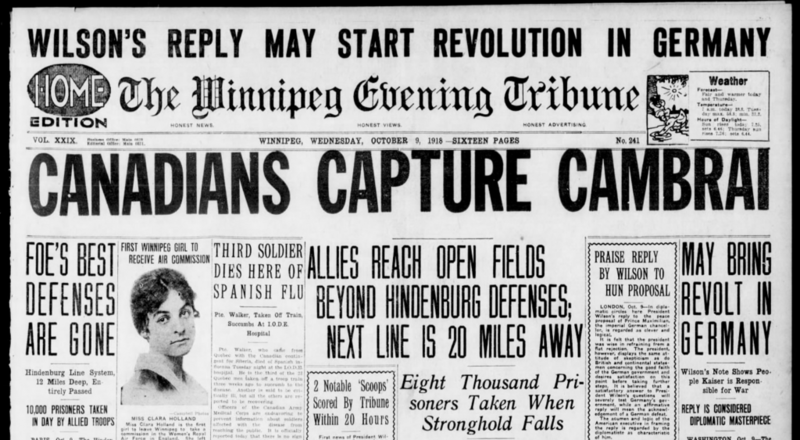 Winnipeg Tribune, October 9, 1918. Late at night on October 8th, 1918, Coulson Mitchell of Winnipeg saved a bridge from demolition during the Battle of Cambrai. The bridges across the Escaut Canal were key crossing points for Canadian soldiers and artillery, but the Germans had been blowing them up to slow the Allied advance. In a midnight patrol, Mitchell cut demolition wires and fended off an enemy attack, saving a key bridge. For his heroic actions, he was awarded the Victoria Cross. Read his full service file here: http://central.bac-lac.gc.ca/.item/?op=pdf&app=CEF&id=B6248-S044.